The Pentagon is shifting 250 troops to reinforce the port of entry at Eagle Pass, Texas, in response to a new caravan headed toward that U.S. border crossing, officials announced Wednesday. The troops are being pulled from Arizona and repositioned in Texas. Those forces include military police, medical personnel and engineers, DoD said. 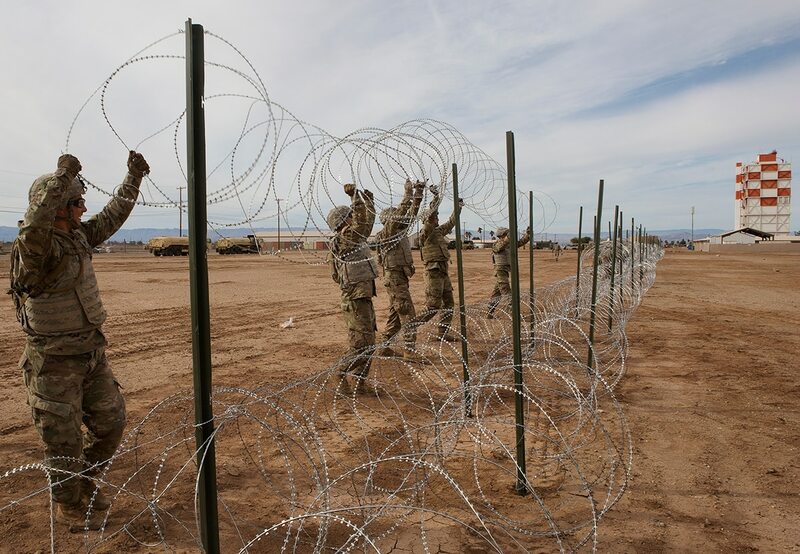 Last week, the Pentagon announced it would be sending 3,750 additional active duty troops to the border to support Department of Homeland Security agents and extend sections of concertina wire barrier another 150 miles. The additional forces will bring the total active-duty presence there to 4,250. In addition, there are 2,300 National Guard forces deployed to the border. The current DHS request runs through Jan. 31. On Tuesday night in his State of the Union address, President Donald Trump continued to press his case for a border wall, saying that the barrier he seeks would be a “smart, strategic, see-through steel barrier — not just a simple concrete wall." “It will be deployed in the areas identified by border agents as having the greatest need, and as these agents will tell you, where walls go up, illegal crossings go way down," Trump said. In fiscal year 2018 the Pentagon spent $132 million on active duty support along the border and $103 million on the National Guard presence. DoD estimates it will spend an additional $448 million in fiscal year 2019 on both National Guard and active duty-supported border security. In addition, New Mexico Gov. Michelle Lujan Grisham, a Democrat, announced Tuesday that she was pulling back the approximately 100 National Guard forces stationed along their state’s border, stating that “New Mexico will not take part in the president’s charade of border fear-mongering by misusing our diligent National Guard troops,” according to a statement reported by the Associated Press.